1961 saw a new American president, John F. Kennedy, attempt to cope with a deteriorating military and political situation in South Vietnam. The Viet Cong with assistance from North Vietnam made substantial gains in controlling much of the rural population of South Vietnam. 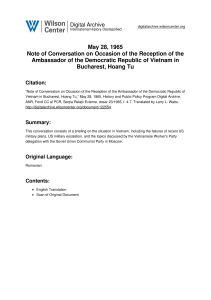 Kennedy expanded military aid to the government of President Ngo Dinh Diem, increased the number of U.S. military advisors in South Vietnam, and reduced the pressure exerted on Diem during the Eisenhower Administration to reform his government and broaden his political base. The year was marked by halfhearted attempts of the U.S. Army to respond to Kennedy's emphasis on developing a greater capability in counterinsurgency, although the U.S. Military Assistance Advisory Group began providing counterinsurgency training to the South Vietnamese army (ARVN) and other security forces. The Kennedy Administration debated internally about introducing U.S. combat troops into South Vietnam, but Kennedy decided against ground soldiers. The CIA began assisting Montagnard irregular forces, American pilots began flying combat missions to support South Vietnamese ground forces, and Kennedy authorized the use of herbicides (Agent Orange) to kill vegetation near roads threatened by the Viet Cong. By the end of the year, 3,205 American military personnel were in South Vietnam compared to 900 a year earlier.North Vietnam continued to urge the Viet Cong to be cautious in South Vietnam and emphasized the importance of the political struggle against the governments of Diem and the United States rather than the military struggle.